A series of studies was conducted on the electrophysiological activity of brain serotonergic neurons in behaving cats. The studies explored a wide variety of behavioral and physiological conditions. 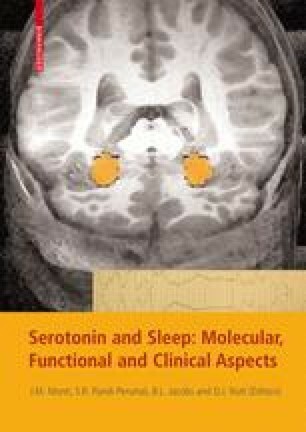 In general, neuronal activity of both rostral (mesencephalic and pontine) and caudal (medullary) groups of serotonergic neurons was strongly related to spontaneous changes in behavioral state (highest in active waking and lowest during REM sleep). Across a wide variety of behavioral and physiological conditions (including stressors), the activity of these neurons was relatively unperturbed. However, one condition, motor activity, strongly affected neuronal activity. A general relationship exists between level of tonic motor activity and serotonergic neuronal activity across all groups of serotonergic neurons. Superimposed upon this in some neurons is an additional relationship in which a further, often dramatic, activation is seen in association with repetitive, central motor program-mediated behaviors (e.g., feeding, licking, respiration, and locomotion). The exact nature of this relationship varies both with the serotonergic neuronal group (e.g., locomotor-related medullary neuronal activity versus grooming-related mesencephalic neuronal activity) and within a particular group (e.g., respiratory-related and feeding-related medullary neuronal activity). We hypothesize that the primary function of this increased serotonergic neuronal activity in association with tonic and repetitive motor activity is to facilitate behavioral output by coordinating autonomic and neuroendocrine function in association with the existing motor demand, and by concomitantly suppressing activity in most sensory information processing channels.